Pancakes have been a favourite breakfast food at home. In Singapore, we have kueh dadar- green coloured pancakes filled with coconut, date palm jaggery syrup and flavoured with pandan leaves. Green coloured?? Nonya style ones had pandan juice and coconut milk mixed into the flour. Those pancakes were about the best I've ever had- soft pancakes encasing a juicy, pandan coconut filling. At a workshop done at a store a year ago, I did the same thing and a friend who walked in a little later told me the entire street was filled with the aroma of those leaves. My mother had a crepe maker which a cousin from Australia had sent. It was a nifty little electrical gadget- you make and pour the batter into a shallow dish, switch on the crepe maker and when hot, turn it upside down and dip the top surface into the batter. Put it down on its legs and a minute later, lift off the crepe and repeat the process. All the crepes were the same size and thickness. The fun would start when the level of the batter went down and the rim of the dish and the handle of the crepe maker would have a stand off- the crepe maker could no longer access the batter. Then there would start a search for shallower dishes. No, you couldn't pour the batter onto the crepe maker. My favourite crepe is from Marche at Singapore. 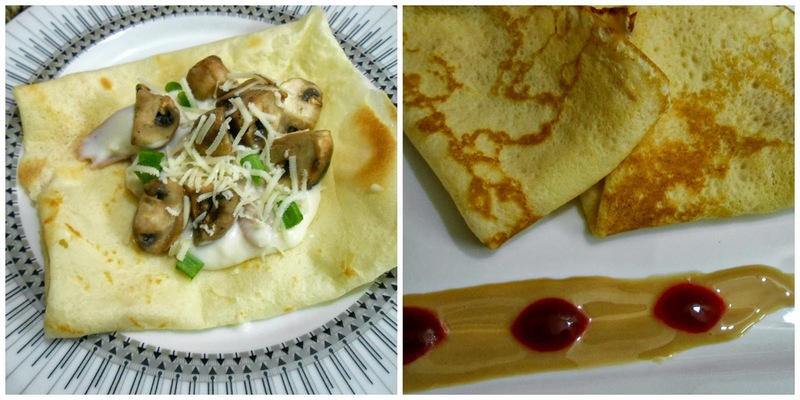 Crepes stuffed with roast chicken and mushrooms, utter deliciousness. And then, on a trip to Canada, eating hot crepes on a cold day, the recipe search started. Oh, and I did pick up a crepe spreader. My largest flat pan is a big 12 inch square, but I persevered and got pretty decent looking ones. I made 2 kinds of crepes, the more butter you add in your batter, the softer they will be. I wanted mine crisp and non stick surfaces are not ideal for this. Oh well, a little wrist exercise won't hurt anyone. Place all the ingredients into a bowl and whip up with an electric beater. If you do not get a smooth batter, pass it through a sieve. Heat a non stick pan, about 8" diameter. Or a larger size will be ideal. Fold a paper towel, swipe it on the butter and rub the pan with it. Turn the heat to medium, pour a ladleful of batter into the pan, with your other hand, swirl the batter about to cover the base of the pan. Pour any extra batter back into the remaining batter. When bubbles appear on the base, flip the crepe over. Cook for another 40 seconds or so. Just remember to cook the crepes on a medium heat! Repeat with the remaining batter, spreading the finished crepes on a wire rack to cool. If you like your crepes to stay crisp, assemble them as soon as they are done and serve immediately. Fold the edges of the crepe, turn it upside down and place on a plate. I piled mine with slices of sausage tossed through white sauce, chunky sauteed mushrooms, diced spring onion and a scrape of cheese. In this recipe, the butter is browned to a light gold colour. The nutty flavour it imparts to the crepe is simply spectacular. Place the butter into a small pan, melt it over medium heat till it turns a light gold colour. Remove the foam as it rises, and 3-5 minutes later, it would have turned a light gold colour and smell nutty. Remove from the heat and leave to cool a little. Mix all the ingredients for the crepe, whisk it well with a hand blender, pass through a sieve if necessary. Stir the butter into the mix, leave for about half an hour and then make crepes. Serve the crepes with jam, sauce, curry, whipped cream, lemon curd, chocolate sauce...get the drift?